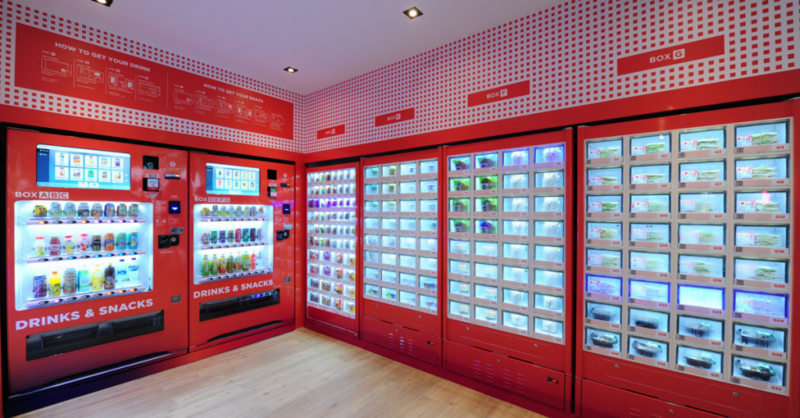 The vending machine culture in Japan has finally arrived in Singapore! With this 24-hour vending machine cafe by VendCafe, you will never have to worry about being hungry in the wee hours of the morning ever again!! Newly opened in SengKang, VendCafe provides hot food, all readily available within 3 minutes. Think of piping hot seafood hor fun, curry rice or chicken carbonara, this place has it all! OMG, we totally wanna check it out now! So Much Food & Drinks Available! VendCafe’s menu changes periodically and boasts more than 30 different types of food. The variety of meals includes Western, Chinese, Malay, Indian and Japanese cuisines. They are all priced between $3.50 and $5. Not only does VendCafe serve food, but it also dispenses a whole variety of sandwiches, salads, snacks and cold drinks. Perfect to cool down during warm days! Payment is as convenient and easy as getting food. All you need is cash, Nets FlashPay, or your credit card to pay for your almost-instant meal at the “cashier-less” cafe! Meals are made even more convenient when consumers are able to dine at the cafe with stand-up dining tables. Do remember to dispose of your trash after you’re done as the VendCafe is an unmanned cafe without any staff. VendCafe serves as a good example of how innovation and technology can reduce reliance on labour in Singapore. What a good idea! We address manpower shortage issues, and at the same time, meet the needs of hungry Singaporeans! If you’re living in the vicinity, drop by VendCafe and have a taste of the food! You’ll be amazed at how delightful the dishes are!